Cicada killer wasps (Sphecius speciosus) are sometimes colloquially known as sand hornets. Despite their large size and fearsome name, these solitary insects don't pose much of a threat -- unless you're a cicada. You'll generally see them only between mid-July and September. If you see an especially large wasp buzzing around, it could be a cicada killer. These insects can reach up to 2 inches in length and look rather formidable. Their bodies are segmented into abdomens and thoraxes. The majority of their bodies are black or dark brown, but they have some bright yellow markings on their thoraxes and yellow stripes across their abdomens. Their wings are translucent and amber in color. Endemic to North America, cicada killers can be found almost anywhere east of the Rocky Mountains. They like to live in areas with little or no vegetation and so can often be found nesting in lawns, on roadsides, at forest edges, on golf courses and around swimming pools. As burrowers, they prefer to reside in areas with well-drained, sandy or light-textured soil. They're more often found in places where annual cicadas also live. 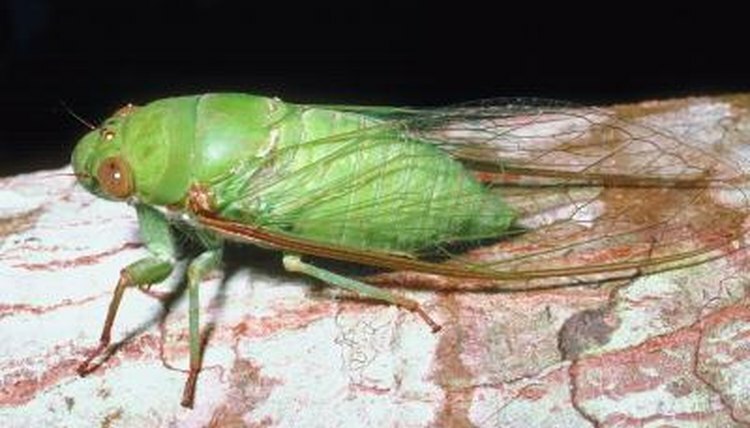 Male cicada killers usually emerge from their nests slightly earlier than females. Once the females do emerge, mating occurs straight away. It's then up to the females to dig burrows in which they can lay their eggs. Using their legs and mandibles, they dig burrows into the soil, sometimes several feet long with many branches. The females make individual cells for each egg, but before sealing the eggs into the cells, they capture and paralyze one or two cicadas and seal them in with the eggs as food for when the larvae hatch. The larvae will overwinter in the cells before pupating and emerging mid-July or early August following year. Although they look formidable, cicada killers are relatively docile. Males may display territorial behavior -- such as dive-bombing peoples' heads -- but have no sting. Females can sting but rarely do so unless provoked. Only active in late summer, most members of this species will die out come the end of September. These wasps are solitary and do not come together to form mass nests or colonies. What Is the Difference Between a Beehive & a Hornets' Nest? What Insects Look Like an Oversized Black Ant With Wings? Can Hornets Stings More Than Once?